“I’m not in a position to interpret their text exchanges so I can’t answer that,” Comey said when asked Friday for his understanding of the meaning of this text. The text from Strzok to Page that Comey said in Friday’s hearing he was “not in a position to interpret” was sent on March 3, 2016. At that time, Comey was the FBI director and Strzok was leading the FBI’s investigation into Hillary Clinton’s use of a private email server when she was secretary of state. Page, who was special counsel to then-FBI Deputy Director Andrew McCabe, was also working on the Clinton investigation. Clinton was running for president—and Strzok and Page revealed in text exchanges conducted on their FBI telephones that they were in favor of her and against Trump. According to a report published in June 2018 by the Office of the Inspector General for the Justice Department, Strzok and Page were also carrying on an “extramarital affair” while investigating Clinton. "Many of the text messages [between Strzok and Page] were of a personal nature, including discussions about their families, medical issues, and daily events and reflected that Strzok and Page were communicating on their FBI-issued phones as part of an extramarital affair," says the IG report. 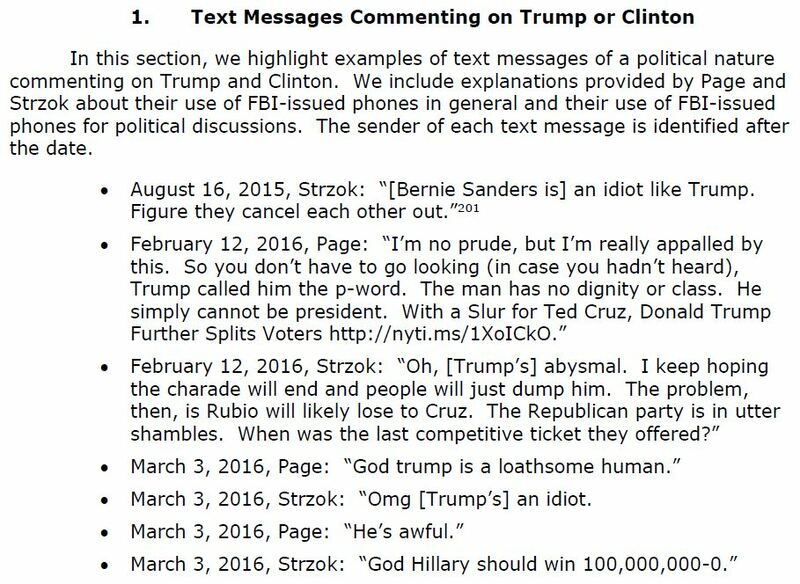 "Some of these text messages expressed political opinions about candidates and issues involved in the 2016 election, including statements of hostility toward candidate Trump and statements of support for candidate Clinton," said the report. The latter investigation began at the end of July 2016. This passage from page 399 of the Department of Justice Inspector General's report on the Clinton email investigation lists some of the texts that Strzok and Page sent to each other in early 2016. “We were deeply troubled by text messages sent by Strzok and Page that potentially indicated or created the appearance that investigative decisions were impacted by bias or improper considerations,” said the IG report. “I’m not in a position to interpret their text exchanges, so I can’t answer that,” said Comey. In the course of a lengthy exchange with Gowdy, Comey said that had he known of Strzok’s texts to Page he probably would have removed him from the case, but he would have been open to hearing an explanation for the texts. “Would you have left him on the investigation had you known about these texts?” Gowdy asked. “I would have certainly been open to listening to any explanation, but when you’re the leader of a justice agency, the appearance of bias is as important as the existence of actual bias,” said Comey. “And do you believe as you sit here today, that had you been aware of the texts contemporaneously, you too would have kicked Strzok off of the Midyear Exam [Clinton] investigation?” Gowdy asked.